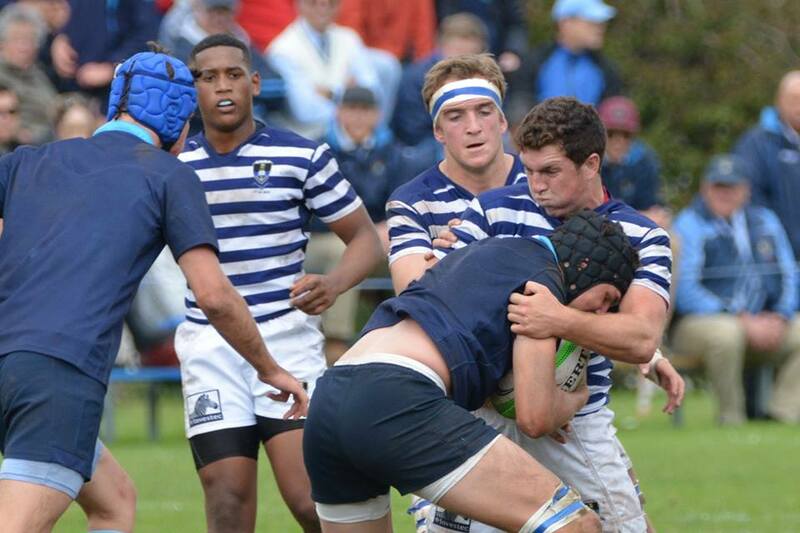 Diocesan College (Bishops) maintained their unbeaten run in the Southern Suburbs of Cape Town by defeating The South African College High School (SACS) by 22 points to twenty. After some light drizzle early in the morning the match was played in lovely conditions at the foot of Table Mountain. Having lost the first fixture away at Bishops and with the season drawing to a close for the many matrics in the SACS team, the hosts came out firing and started at a high-tempo. SACS varied their play nicely and asked early questions of the Bishop’s defence. Tireless lock Jean Minnaar again making one of his telling breaks but unfortunately for SACS it amounted to nothing. Apart from another clean break by prop Ethan Burger the majority of the remainder of the half belonged to Bishops. A break out by fullback Bingo Ivanisevic put Bishops onto the attack and on twenty-five minutes it was he who opened the scoring. Bishops took a scrum when they received a penalty under the SACS poles. They moved the ball left from the scrum and Ivanisevic used his size and strength to crash over in the corner. Flyhalf Jordan Meyer converted. SACS were soaking up lots of pressure but secured a vital turnover two minutes before the interval. Flyhalf Michael Abrahams, earning his 50th cap for the hosts, inexplicably missed touch allowing Bishops one more opportunity to attack. A few phases later scrumhalf Liam Kloosman darted around the side of a ruck to score. Meyer missed the conversion but it was still a hammer-blow for SACS just before half-time. SACS came out for the second half determined to secure the win. They again started well and after scrumhalf Thurston Cloete tapped a penalty and broke clear it was him who finished off the try-scoring move after seven minutes. Wing Matthew Hayes converted. Three minutes later Hayes converted the first of two penalties which would see SACS take a slender 13-12 lead with seventeen minutes to play. It was an entertaining end-to-end match with many key turnovers. In between Hayes’ penalties Bishops had had further threatening attacking opportunities which they weren’t able to convert. On twenty-one minutes Bishops had a kickable penalty but chose to go for touch. SACS sacked their maul attempt but Bishops moved the ball wide. Once again it was Ivanisevic who made the running. He was a little lateral but wing Alex Jankovic straighten beautifully off his should and raced in to score. Meyer nailed the conversion from in front of school mates to see Bishops regain the lead. Ten minutes later Bishops received a penalty for offside after SACS had lost their own lineout. Meyer put Bishops eight points clear leaving SACS with a mountain to climb in the final four minutes. SACS came onto the attack but failed to hold onto the ball when it counted, twice grubbering the ball away when in strong attacking positions. Right on time they managed to maul their captain Craig Bylin over for a converted try but it was too little too late. In a show of old-fashioned good sportsmanship Bishops made a tunnel and clapped the SACS players off the field before joining their jubilant supporter in their famous war-cry. Both teams have two more local derbies left this season. 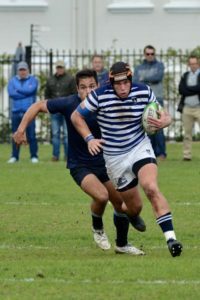 With a bye weekend next weekend, SACS travel to Rondebosch Boys’ High in two weeks time, while Bishops will go over the hill to Wynberg Boys’ High. 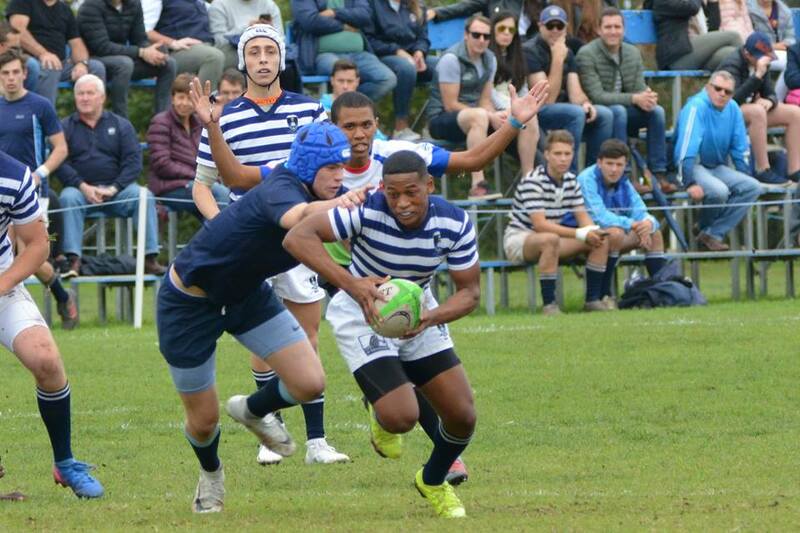 Both matches will be fiercely contested but the latter will see Wynberg dead-set on ending Bishop’s current and somewhat unexpected run of form. Also on 18 August SACS play host to two schools international fixtures: At 12h15 – France vs Wales and at 14h05 – SA Schools vs England. I thought that the two teams looked more evenly matched this time with comparison given to the away game, played earlier in the year. Bishops seemed to make more of their chances and had a better tactical kicking game. Yes, it was a fine moment to see the send off offered by Bishops at the end of play. Kudos to them. I agree totally with the sentiments expressed above. Sacs had some new faces and to my mind played the game with a bit more variation – not as predictable as usual. I enjoyed all the matches. The matches between these old rivals are always special and enjoyable. May Sacs build on this performance for the two remaining games.